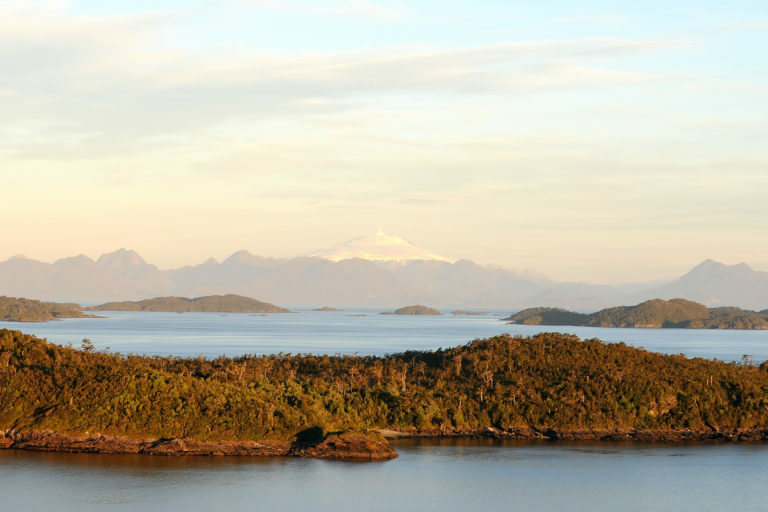 Last fall, Chile’s Supreme Court ruled in favor of the indigenous community of Pu Wapi in its quest to manage 80 square kilometers (31 square miles) of marine habitat in southern Chile. The ruling means that local officials must reconsider the community’s application to designate a so-called Coastal Marine Space of Native Origin (ECMPO in its Spanish initials). The law enabling indigenous communities to establish ECMPOs has been questioned for prioritizing the demands of native peoples over those of other users in coastal areas, with the salmon fishing and aquaculture industry a particularly vocal opponent. The ruling has drawn attention to a legal instrument known as a Coastal Marine Space of Native Origin (or ECMPO in its Spanish initials). 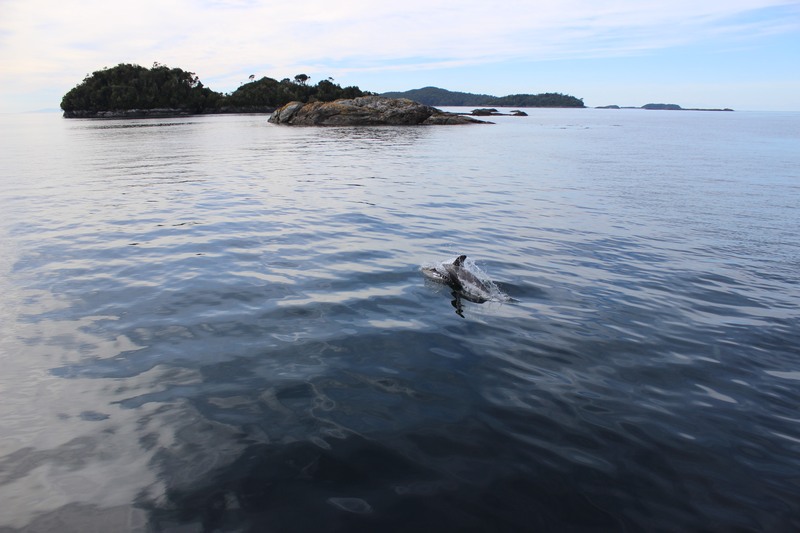 In 2008, Chile created ECMPOs as a special category of marine territory that are managed by indigenous communities who can demonstrate that their ancestors used the area. ECMPOs arose from the desire to protect the cultural wealth of indigenous peoples, enabling them to take control of the marine spaces that undergird their spirituality, medicine, livelihoods and recreation. 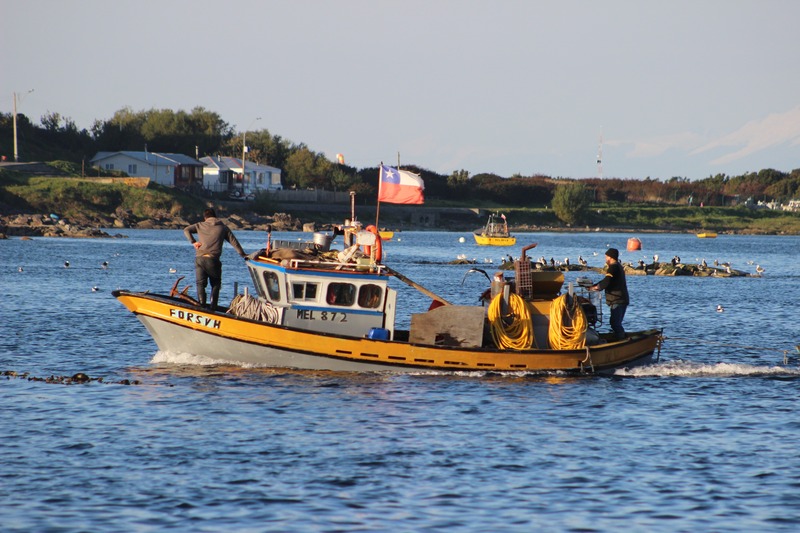 But they have also come to represent an important tool for those attempting to slow down the rapidly advancing salmon industry, which is taking a toll on southern Chile’s marine environment. The case of the Huilliche-Chono of Pu Wapi is seen as a test for how widely ECMPOs might be applied. The Guaitecas Archipelago. Image by Susannah-Buchan. The Guaitecas Archipelago, situated in Chile’s southern region of Aysén, is an extension of land crumbled into dozens of islands. Some of the islands are bare due to persistent, icy winds, while others are covered with dense forest. For more than 6,000 years, the archipelago’s islands and channels were home to the indigenous Chonos, nomads and canoeists, hunters and fishers. But the Chonos are generally considered culturally extinct as a result of slavery, acculturation and evangelization. Communities of another indigenous group, the Huilliches, a southern group of the Mapuche people, now live in the Chonos’ former territory. But this settlement is not a new one either. When the Huilliches arrived, at some point before the 1500s when Spaniards documented their presence, the Chonos still existed. The Huilliches “adopted part of their language, customs and political organization,” according to a study by the National Corporation for Indigenous Development (CONADI in its Spanish initials). “In a way, the Chono identity still survives in the current population” through the performance of characteristic everyday activities and customs, the study says. For that reason, the communities that live in this area are identified as Huilliche-Chono. Pu Wapi is one of them. A fisher in the Guaitecas Archipelago. Image courtesy of Costa Humboldt. The inhabitants of Pu Wapi live off the sea as fishermen and shellfish divers. From the seabed, they harvest sea urchins, clams, mussels, abalones, limpets, and crabs. Sometimes at night they use traditional shacks constructed on the shore from thick branches with plastic roofs to shelter the fishermen at work. Daniel Caniullan, Pu Wapi’s lonko, or leader, began the process to enable the community to manage more than 80 square kilometers of the sea around the island of Leukayek, one of 40 that make up the Guaitecas Archipelago. The objective was to “protect the lands in which we have always lived from the expansion and impact that the salmon industry has on the sea,” he said. But in March 2017, nearly three years into the legal process, at the final stage when the proposal to create an ECMPO was to be accepted or rejected, the Regional Commission for the Use of Coastal Areas rejected the Pu Wapi community’s application. 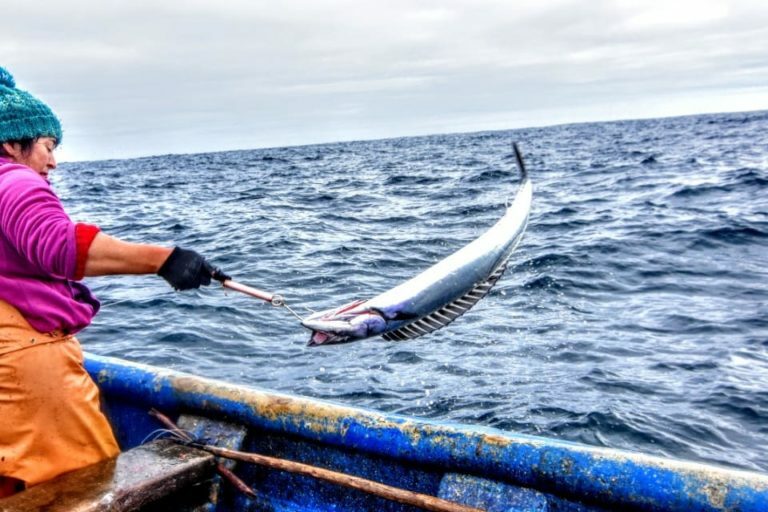 The commission said the main reasons for the rejection were that artisanal fishers would be excluded from using resources in an area where they, too, have historically lived; that the creation of an ECMPO would block navigation routes; and that representatives of the aquaculture sector had also raised concerns. 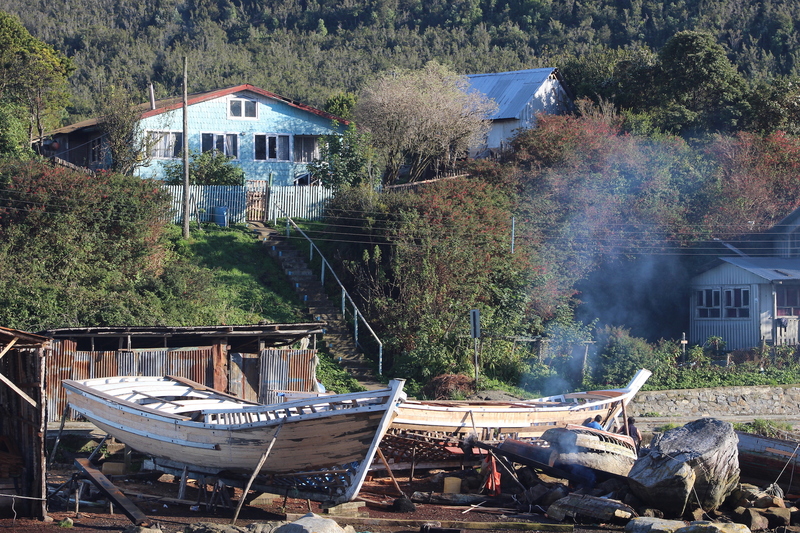 A boatyard in the Guaitecas Archipelago. Image by Susannah-Buchan. Correa said that, in effect, the indigenous communities would manage the area but the law allows other users to occupy it. “The law does not exclude the artisanal fishermen, nor does it prevent them from continuing their productive activities,” he said, adding that “impeding people’s access, transport and free navigation within the Coastal Marine Space of Native Origin is prohibited by the same law.” Moreover, he said, territory requested by communities may not include areas that are already designated for other uses. Based on this argument, the Pu Wapi community presented a complaint to the Regional Commission for the Use of Coastal Areas, asking for their request to be re-evaluated. However, the region’s highest government official, Aysén’s superintendent, Karina Acevedo, rejected the complaint without assembling the commission. Caniullan, Pu Wapi’s lonko, filed an appeal to the Court of Appeals, but it was rejected. The last chance was the Supreme Court, and this was where the lonko went. After a year of waiting, Chile’s highest judicial authority ruled in favor of Pu Wapi by five votes to zero. This rendered Superintendent Acevedo’s decision null and void and forced her to convene the regional commission to vote once again on Pu Wapi’s application. Chile’s so-called Lafquenche law, which allows for the creation of ECMPOs, has been vigorously questioned for several reasons. The issue causing the greatest conflict is probably the one stating that EMCPOs take priority over any other pending usage request, for example, for concessions or leases. While an EMCPO is being processed, other requests to use the same area must wait. In practice, this can take a long time, according to Correa. “It takes at least four or five years to process an EMCPO … despite the fact that according to the law, it should not take more than two years,” he said. Valesca Montes, director of fisheries in Chile for WWF, said the law on ECMPOs clashed with existing legal frameworks on the same issues, and that this had caused disputes. She referred specifically to so-called Areas of Management and Exploitation of Benthic Resources, marine areas exclusively assigned to organizations of artisanal fishermen for sustainable harvesting of species that live on the seafloor. Another is a law that grants artisanal fishermen the right to manage coves to develop activities complementary to their fishing. “Because ECMPOs take priority, this begins to create difficulties between the different parties, for example between indigenous people and artisanal fishermen,” Montes said. In the case of Pu Wapi, at least, there doesn’t seem to be disagreement between the indigenous people and the artisanal fishermen. The leaders of both groups say they agree with the Pu Wapi’s fight. “It’s everyone’s fight,” said Carlos Ruiz, president of the local artisanal fishermen. But, he added, “there are always some people who are not well informed and who have little education and little understanding, who believe the falsehoods. Like the one about the artisanal fishermen not being able to work there anymore. “We will continue to share as we always have done, but caring for what we have,” said Ruiz. “I don’t need a study that tells me how damaged the sea is. I’m a shellfish diver and I know what is happening down there,” said Pu Wapi’s lonko, Caniullan. Some former shellfish beds no longer exist, he said. Marine life in the Guaitecas Archipelago. Image by Susannah-Buchan. Ruiz agreed, adding that traces of industrial pollution that had gone unchecked were apparent on the marine environment. Ruiz is 51 years old and has been working for 41 of those. “When I was 10 years old, my father took me out to work,” he said. Back then, he said, there were no ropes, buoys or plastic items that abound today. “That rubbish doesn’t come from artisanal fishing. They are not the materials we use,” he said. He added that since the salmon fishery concessions were granted on the fishing grounds, he and his colleagues have had to go and find new places to fish. Both leaders said they weren’t against the salmon fishing companies, especially given the work they provide. The problem, as they see it, is that the companies want more concessions and don’t take care of the environment. 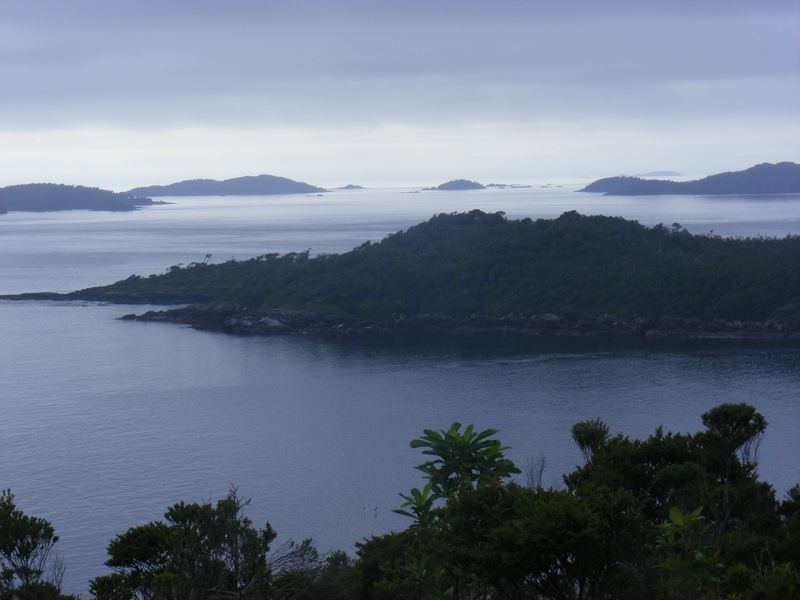 Islands in the Guaitecas Archipelago. Image by Susannah-Buchan. The salmon industry is expanding rapidly in southern Chile: 1,322 salmon aquaculture concessions have been granted so far in the country’s three southernmost regions of Los Lagos, Aysén and Magallanes, according to the country’s Undersecretariat of Fisheries. The coastal communities are well aware of that. “This is the application that has them trembling in fear,” Caniullan said. Banner image courtesy of Costa Humboldt. 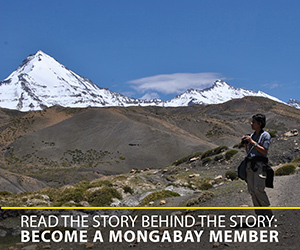 This article was first published by Mongabay Latam and adapted by Rebecca Kessler.